I read this article and found it very interesting, thought it might be something for you. 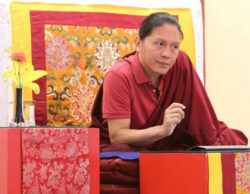 The article is called Easter retreat Nyung Nay – Traditional Tibetan Fasting Ritual – 2 pairs and is located at https://www.ripaladrang.org/event/easter-retreat-nyung-nay-traditional-tibetan-fasting-ritual-2-pairs/. The Nyung Nay is a traditional spiritual fast in Tibetan Buddhism that aims to purify outdated patterns of behaviour, offering us the opportunity to free spiritual, emotional and psychological resources and thus accelerate our personal and spiritual growth. With Dungsey Lhuntrul Dechen Gyurmey Rinpoche, a highly accomplished ritual master in the tradition of Vajrayana Buddhism, he was recognized as the reincarnation of Jigme Tempay Gyeltsen, the third Tamdrin Lhunpo Chogtrul.